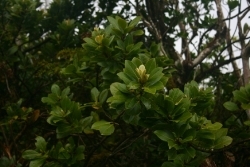 The littoral Laurel forest of the Azores is composed mainly by species like Picconia azorica (Pau-branco) and Myrica faya (Firetree). 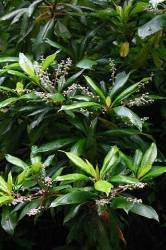 After the littoral strip we find a termophyle laurel forest which principal components, apart from "Pau-branco" and Firetree, are also Laurus azorica (Azorean Sweet Bay), Erica azorica (Azorean Heather), Viburnum trileasei (Laurustinus) and Frangula azorica (Buckthorn). 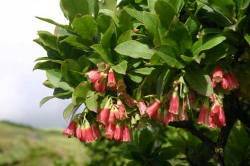 Finally, we find an altitudinal laurel cloud forest which besides the Azorean Sweet Bay, it is mainly characterised by the presence of Ilex azorica (Azorean Holly), Vaccinium cylindraceum (Azorean Blueberry), Prunus azorica (Azorean Plum) and Juniperus brevifolia (Azorean Cedar). The natural habitat of the Priolo comprises the non coastal Thermophylic Laurel Forest and the altitudinal Laurel Forest. 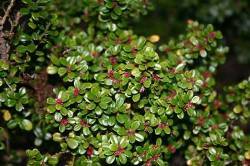 Ecology: Present in Laurel Forest, Juniperus and Pittosporum forest between 250 and 750m. Ecology: Rocky slopes, coastal slopes and peat soils between 20 and 800m. Ecology: Laurel forest over 300 m of altitude. It colonizes recent and non anthropic rocky substrates. Humid and exposed places, forests, landslides and mountain warm cavities. 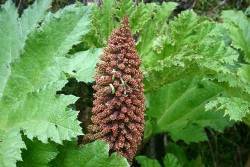 Ecology: Nearly extinct plant existent in shadowy zones between the 500 and the 600m. It is also an important species for Priolo's habitat, from a structural point of view. Ecology: Very resistant to drought. It is a pioneer in eroded areas. Can be found from 200 to 1100m in laurel forest. Ecology: Slopes, precipices, dense laurel forest, natural hedgerows, road and walkways margins (300-700m). 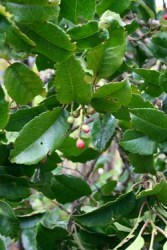 Ecology: Although being an important feeding resource for the Priolo , it develops an aggressive invasive role on laurel forest (500-800m). 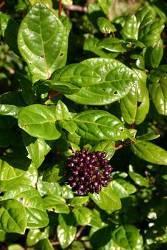 Ecology: Ornamental plant escaped from gardens. 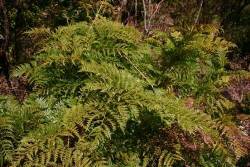 Appearing in road slopes and walkway margins, Pittosporum, Laurus forest margins and Cryptomeria plantations (500-800m). Ecology: Humid places, water lines and margins, fields and quagmires. 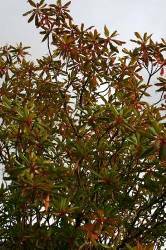 Ecology: Ornamental plant escaped from gardens. 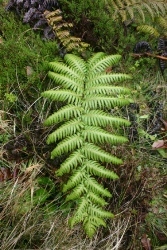 Appears at road margins and slopes (<800m). Ecology: water lines and margins, fields, roads (200-600m). Ecology: Very tolerant to drought. 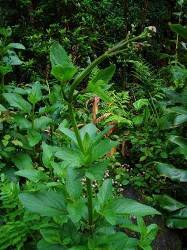 Appears in laurel forest in low exposed places, either humid or dry (300-900m). 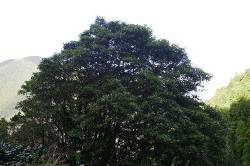 Ecology: Original laurel forest. Appearing in humid and warm places, reforestation in low and medium altitudes (<900m). Ecology: Dense Laurus, Juniperus forest and vegetation with Myrica and Pittosporum (400-800m). 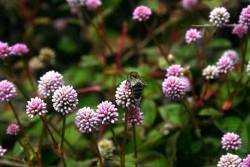 Ecology: Resistant to exposure and drought. Laurel and cedar forests and coastal slopes (<1500m). 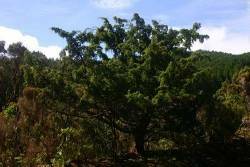 Ecology: Dominant tree in ancient azorean forest. Nowadays it just survives in relatively intact areas between 600 and 900m. Ecology: Humid and shadowy bushes over 300m. Status: Native from Macaronesia, with some locations on Iberian Peninsula. Ecology: Laurel forest, Myrica faya forest, clearings, rocky places close to water lines and hedgerows (500-700m). 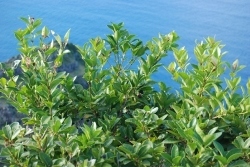 Ecology: Myrica and Pittosporum forests up to 750m and in coastal slopes. 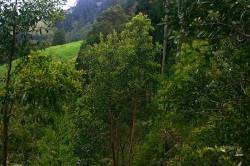 Ecology: Protected bushes and forest, little river margins and fresh slopes from 400 to 1800m. 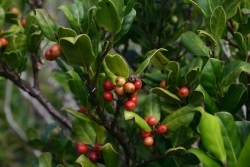 Ecology: Although being an important feeding resource for the Priolo it develops an aggressive invasive role on laurel forest (500-800m). 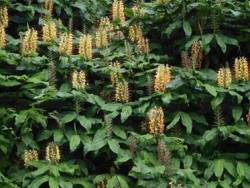 Ecology: Ornamental plant escaped form gardens. 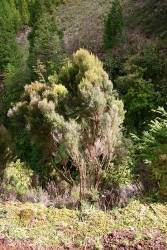 High invasive potential representing a great threat to azorean laurel forest. 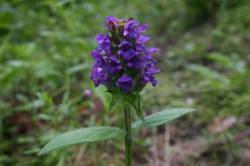 Present in sub layer of all kinds of forest, natural and anthropic slopes cultivated lands, and forest margins (<950m). 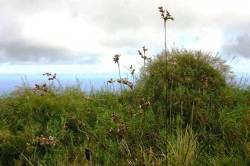 Ecology: Invasive plant, introduced as protection for orange plantations. Existent as protection, bushes and hedgerows, it supposes one of the most problematic hazards for the low and medium altitude forests of Erica sp. 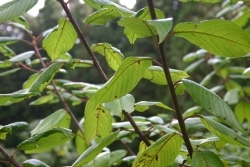 and Myrica faya (50-650m). 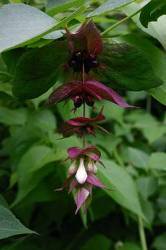 Ecology: Ornamental plant escaped form gardens. 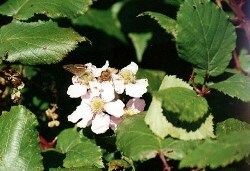 Highly invasive in wet fields, ravines and slopes (500-700m). Ecology: Cultivated for wood. 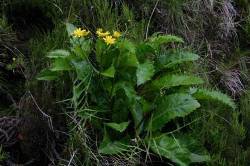 Naturalized, it expands in ravines and forests below (<700m).